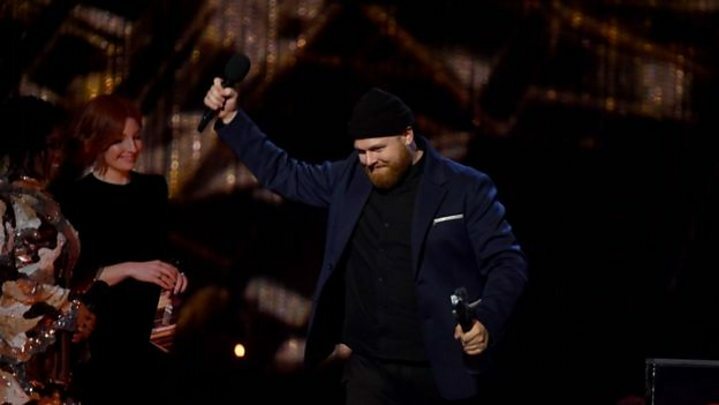 Singer Tom Walker has dedicated his Brit award for best British breakthrough act to his Scottish gran. Accepting the accolade, which is voted for by the public, he said: "To my gran... yes Gran, here we are!" The Scots-born star was also nominated for best single for "Leave A Light On", but lost out to "One Kiss", by Dua Lipa and fellow Scot Calvin Harris. Harris also won the best producer award. The two Brits he won are his first, despite 15 nominations. Harris and Walker were among the stars at London's O2 Arena for the 39th Brit Awards. Walker beat Jorja Smith, Ella Mai and Mabel to the breakthrough award. Speaking after receiving the honour, he said: "Wow, let me tell you I was not expecting this, oh my God. He has previously told BBC Scotland that his 81-year-old granny is his "role model". She has been to all of his gigs in Scotland. Calvin Harris collected two awards - one for best British producer, and best single, for "One Kiss", with Dua Lipa. "One Kiss" has been viewed more than 92m times on YouTube. Receiving the award was "absolutely amazing", he said. He was presented with the best producer accolade by model Suki Waterhouse who introduced him as "the king of Scots". Her fellow presenter, DJ Annie Mac, noted that Harris had "come a long way from stacking shelves in his M&S in Dumfries". It is the star's first Brit award, despite 15 nominations. He said: "I've been coming here for a few years and never had the opportunity to say anything.